The dedicated team behind the MMPA merchandise program (left-right): Duane Farmer, Joe Mishler, Katie Pierson and Jake Riley. Dust kicks up on the dirt road as the milk truck rolls up to a dairy farm, ready to pick up raw milk for delivery to a local processing plant. But as the hauler meticulously hooks up his hose to the bulk tank and gathers milk samples, there’s often a few more things he must unload: farm supplies. Sometimes it’s a refill on I-Deal Barrier teat dip, others it’s a san spray rubber hose and a new bulk tank brush. Originating at the MMPA merchandise warehouse, members have access to a wide variety of farm supply products sold at a reduced cost. Midst rows of industrial shelving on concrete floor in Mt. Pleasant, Michigan, a team of four merchandise staff manage members orders, prep deliveries, mix teat dip and track the vast inventory. Orders disperse from the warehouse destined for MMPA farms by hauler delivery, direct shipping or member pick-up. “It is a huge benefit for us to order supplies through our hauler. We don’t have to wait for a route delivery truck service to stop on a designated day and hope that they have what we need on the trailer. The merchandise program warehouse has pretty much everything we need here on our dairy,” remarked Casey Sparks of Hesperia, Michigan. The merchandise program supplies many of the needs of MMPA’s farms, big and small, in Michigan, Indiana, Ohio and Wisconsin. Started in the early 1970’s, the merchandise program was added to help member farms have a consistent and reliable source for cleaning supplies and parts. It has since grown to add many product lines and options for members to order. Support from vendors is available for some products as well. Commitment to service, consistent quality, convenient delivery and comparable prices can all describe the MMPA merchandise program. The merchandise program is a service for any MMPA member to provide them with products they may need to help a farm do what they do best: provide a clean, safe food while caring for their animals. Punctuality is a priority for warehouse staff members to insure farms get what they need as soon as possible. Orders for parts not in the newly revised merchandise catalog may be ordered through vendors if not kept in stock. Staff work hard to provide great customer service to members and haulers helping them do their jobs. With only four merchandise supervisors throughout the long-standing program, it shows the commitment to providing quality and consistent service. 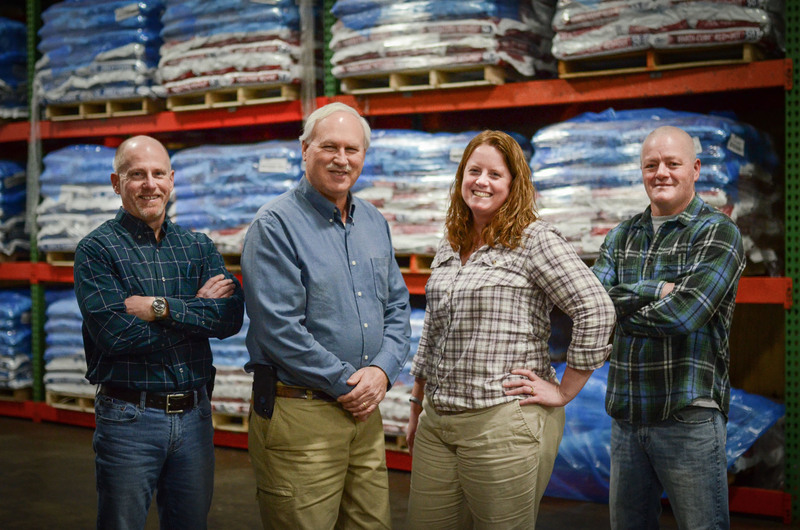 Current team members Katie Pierson, Jake Riley, Joe Mishler and Duane Farmer have an average of 24 years of experience working with MMPA in a variety of positions from field representative to sample auditor among others. “I enjoy working with members and their haulers to meet a farm’s needs. It is important to us to provide the right products for the job whether it is tank washer parts, towels for in the parlor or CIP detergent. One of my favorite parts of my job is when I am able to solve a problem for a farm while saving money,” said Pierson, merchandise coordinator and energy auditor. In addition to products stocked at the warehouse, members can take advantage of vendor-paired services. Land O’Lakes provides several milk replacer options for members, teams up with MMPA to provide calf care schools annually to members to share information and tips on calf rearing. Members also have access to EcoLab representatives to set up cleaning programs, trouble-shoot high count problems and preventative cleaning wash-ups for CIP (clean in place) systems. These vendor services can be facilitated with a simple phone call to the staff at the warehouse. The program is designed to be self-sustaining in that at the end of the year, profits are returned as patronage to participating farms. “Prices can fluctuate a little throughout the year, but we work hard to receive the best rates from vendors so farms can receive products at reasonable prices,” added Farmer. After moving the warehouse from St. Louis, Michigan to its current location along the US-127 corridor in 2014, the merchandise team added a teat dip mixing system and increased inventory with the additional space. The new location, convenient for dispatching product deliveries, proved to be a more efficient facility and offers room for growth for the program in the future. The warehouse team also recently released a new and improved merchandise catalog for members. It provides a better look at what is available in stock in Mt. Pleasant with pictures and stock numbers for easier ordering. Farms can order from the catalog online, by fax, through their hauler or by calling the warehouse. In addition to many haulers keeping merchandise inventory for easy delivery, farms may sign up for the direct delivery service. Deliveries can be scheduled for a few times a year up to every four weeks. From the time the MMPA merchandise program takes an order until every last item makes its way to a member farm, the dedicated team behind the convenient program prides itself on consistent quality with a commitment to service. This article originally appeared in the March 2018 issue of the Michigan Milk Messenger.